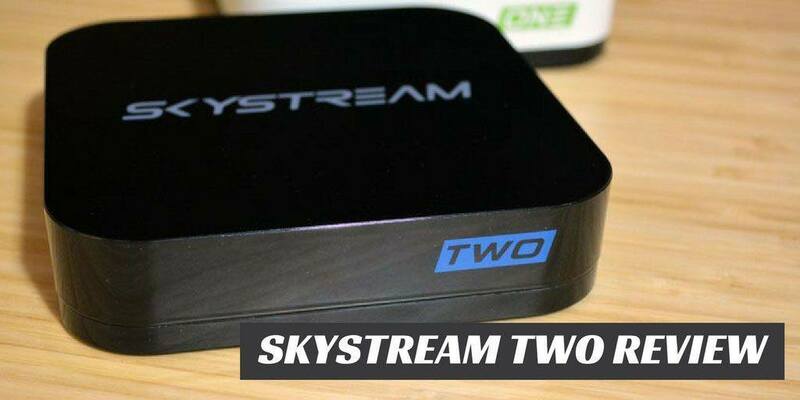 One of the most anticipated Android TV boxes of the year is finally out: The SkyStream Two. SkyStream already had a great streaming device on their hands, but they weren’t content to just rest on their past success. They wanted even better performance this time around. 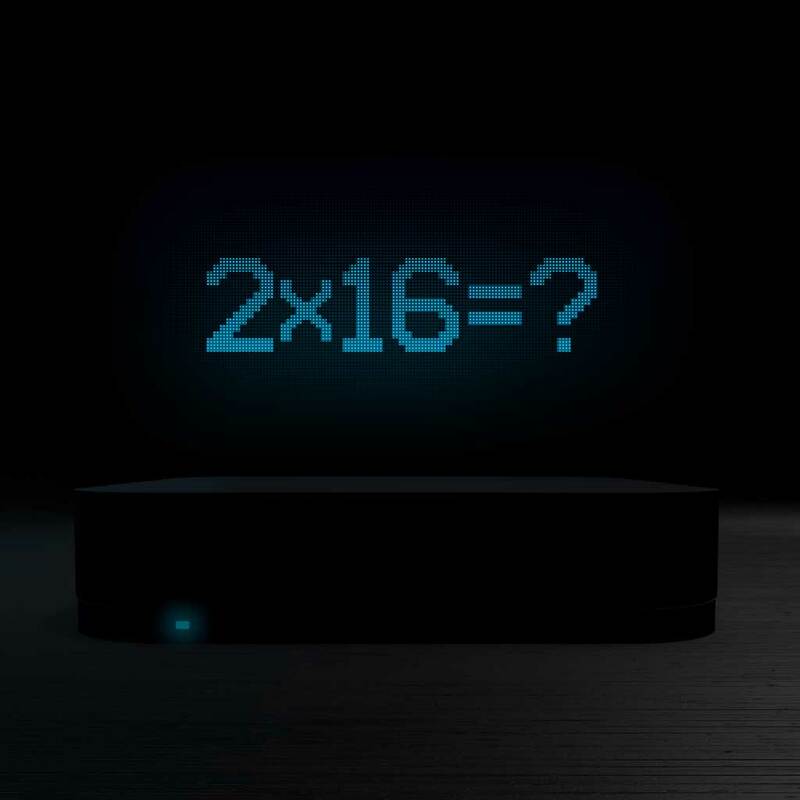 In late October, when the SkyStream Two was nearing it’s launch date, they started an awesome social media campaign to build interest for the next generation of SkyStream devices with teaser images like this one. The whole campaign emphasizes SkyStream doubling-down on performance and trying to make a truly elite streaming device. It obviously worked because so many of you have been asking what I think of the new SkyStream Two. Now it’s time to find out. So what’s different? Is it worth it? Read on in my SkyStream Two review. SkyStream doesn’t put out new TV boxes very often, so they wanted to make it worthwhile for people to upgrade – especially if they’ve recently bought a SkyStream One. Android 7.1 Nougat: Depending on when you’re reading this, it may not seem like a big deal that this box comes with Android 7.1. But right now, there are still quite a few TV boxes being shipped with versions of Android 5 and Android 6. In addition to tons of new features, Android Nougat also has the ability to constantly improve an app’s performance as it it running. The same app running on Android 7 should be faster than that app running on an older version of Android. …and the RAM is faster too: The memory chips in the SkyStream Two are DDR4 instead of DDR3, which is a faster clock speed for the memory. Double the storage space: SkyStream upped the storage on the SkyStream Two to 32 GB instead of the 16 GB that is standard among most TV boxes. Widevine certification: Here’s the big one! Widevine is a digital rights management (DRM) certification for streaming media. More importantly, it’s a requirement to stream HD and 4K content from sources like Netflix, YouTube and Sling TV. 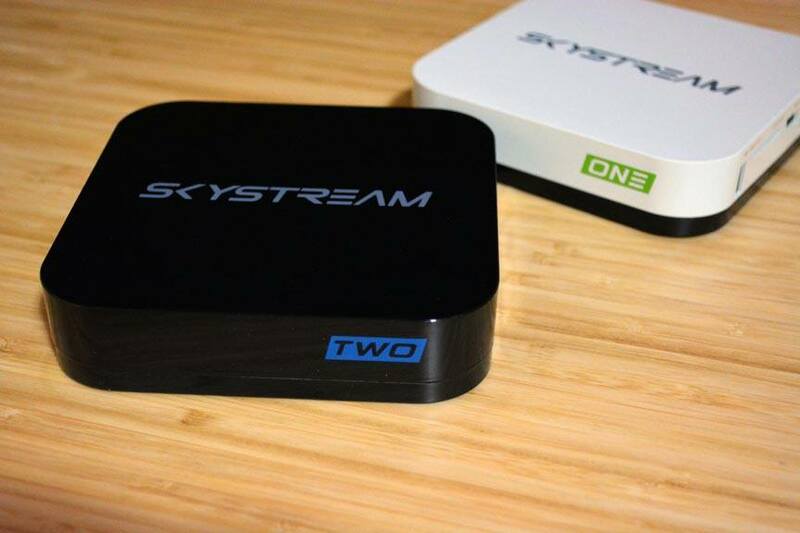 The SkyStream Two has it, which is extremely rare in Android TV boxes. For more on Widevvine and what it means, check out my article on Will my device stream Netflix in HD or 4K? I’ll start off with a shocker: The SkyStream Two doesn’t use Kodi. 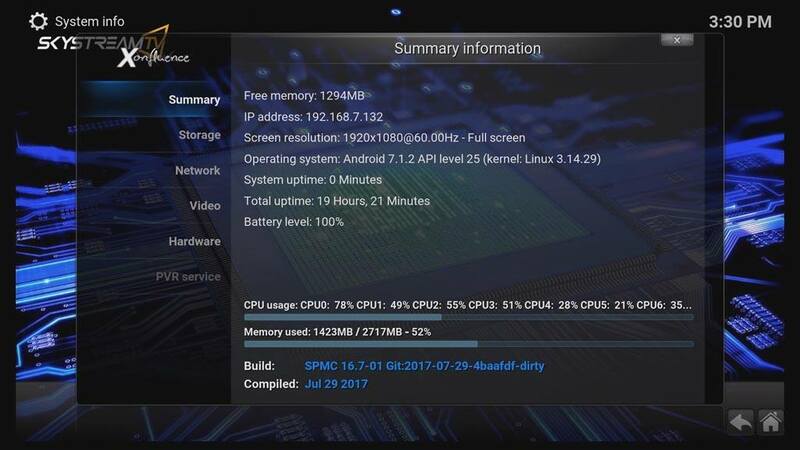 For those of you that don’t know, SPMC is a fork of Kodi which is developed and maintained by one of the (if not THE) biggest Android developer\maintainer for Team Kodi. When he left the team in 2016, he started putting a lot more effort into his own project called SPMC. Normally, I’m not a big fan of Kodi forks. I think in general, you’ll get better performance and updates from the official version – except if you run an Android device, in which case SPMC is definitely the way to go. 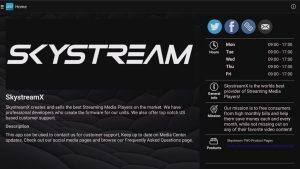 The SkyStream Media Center uses the familiar Kodi Confluence skin that’s been around for years, so navigating the interface should feel instantly familiar. There are sections on the center menu bar for Movies, Sports, TV Shows, Music, Utilities as well as more specialized menus for content from Real Debrid and Live TV. Getting to the content you’re looking for can be a bit of a challenge at first, only because there are so many options to choose from. Once you’ve been using the Media Center for a little bit, it all becomes second nature and intuitive to navigate. The SkyStream Updater app isn’t new. Actually, it’s been around since the early days and it’s one of the things that sets SkyStream apart from other TV box manufacturers. 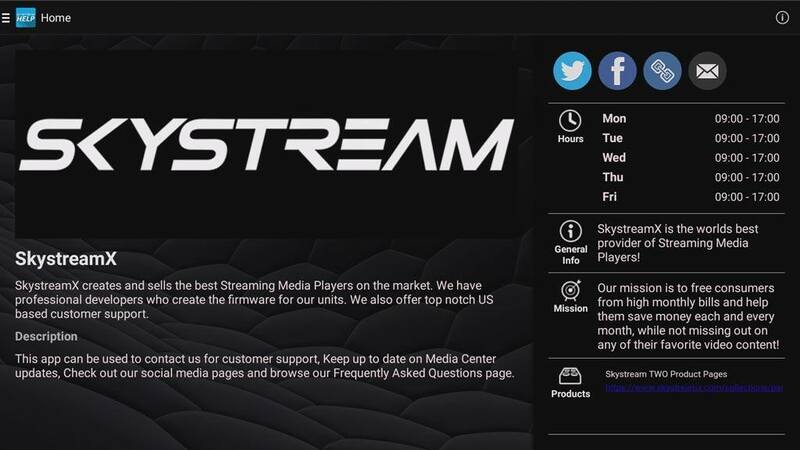 Here’s the gist of it: SkyStream doesn’t technically sell fully loaded Kodi boxes – that’s not legal in the UK and it’s questionable in several other countries as well. How they get around this is to sell their TV boxes bare-bones, but also give you a handy-dandy way to install all of the most popular addons in one shot. That’s where the SkyStream Updater comes in. The Updater app does two main things: Install the most popular Kodi addons and maintain those addons so that they always work. “Kodi” isn’t quite correct here. As I mentioned above, the Media Center that’s included with the SkyStream Two is actually based on SPMC. But since the two are so similar, I’ll keep using the term Kodi Addons to describe them. When you first start the SkyStream Two (or the older SkyStream One), you’re given a choice how to configure the box using the Updater app. It will install the Family Friendly addons, or a slightly different version with the Adult options enabled. Don’t worry…I won’t judge which option you pick. It’s a “one click” installation and only takes a minute or so. After that, the next time you start Media Center, it’ll have all of the options already set up for you. Choosing an option is only the start. After that, things get even easier. 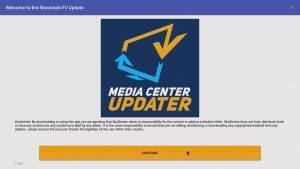 The team at SkyStream will maintain the addons that you’ve installed via the SkyStream Updater app. If an addon stops working, they’ll remove it. If a new, better addon comes out, they’ll add it to the list. They try to make streaming easy. The best part is they don’t charge you a small fortune for a box that will update itself, unlike some other TV box manufacturers do (I’m looking at you StreamSmart). SkyStream adds that value without a big hit to your wallet. OK…this is a really cool idea. What about if a TV box had a help app right on the box itself. I mean, think about it. You’re going to have problems, so why not have a help app right where you need it to be? Think of the SkyStream Help app as your launching pad to quickly find solutions to those problems. It’s got their customer support phone numbers at the top of the page, along with links to their social media pages and FAQ’s. You’ll also find links to their official downloads and their official Facebook support group. The SkyStream Two is a premium player and it’s got a premium price tag. At around $200, it’s in the same price point as the NVIDIA Shield TV. To a point, that’s a fair comparison, but only to a point. Although they’re both higher-end streaming devices, they’re aimed at different consumers. The NVIDIA Shield TV is aimed at the consumer who wants the fastest streaming experience and best picture quality possible. What it lacks is the content itself. If you want to watch something on the Shield, you’re going to have to watch on Netflix, Amazon Prime Video or take the time to configure Kodi yourself. There’s also the little matter of maintaining all of your Kodi addons and filter out any that don’t work anymore. By comparison, the SkyStream Two isn’t going to give you the raw performance of the Shield, but it’s going to be much, much easier to find and watch content because they maintain all of the Media Center addons. If you need support, it’s also right there at your fingertips. If you really want to look at the value of what SkyStream gives you, it’s only fair to compare it against other TV boxes that give you that “fully loaded” experience. Most of those boxes as hundreds of dollars more expensive. Looking at it that way, I think the SkyStream Two is a good value for your money. Now for the fun part. Well…it’s fun if you’re a geek at heart. Every new TV box that comes across my desk gets put through a battery of tests to see how it performs. These tests don’t always equate to real world performance, but they’ll usually give you a good idea of how one box stacks up against another. One thing to keep in mind, you’re looking for big differences in scores here. For example, a difference between 30,000 and 31,000 isn’t very noticeable, but you’ll definitely see the difference between 30,000 and 40,000. 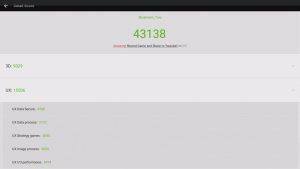 First on the list was AnTuTu Benchmark, which has been a staple of this site since the very beginning. Here, the SkyStream Two performs very well, scoring over 43,000 in the overall test. 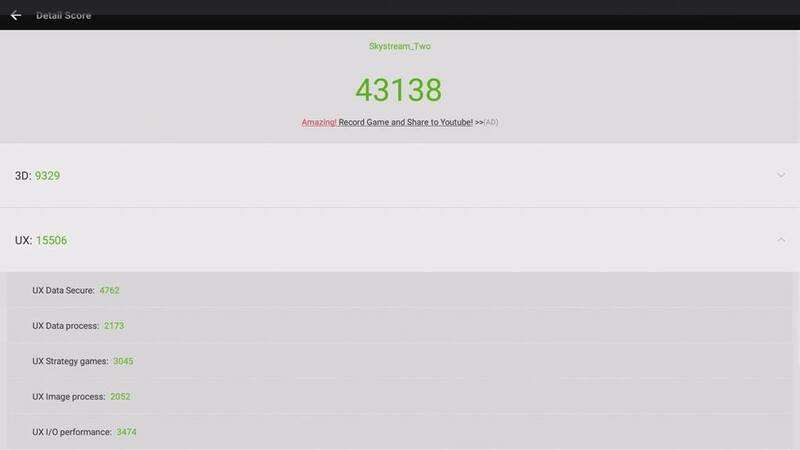 This compares to a score of 36,000 for the older SkyStream One. To me, that means that the snappier feel of the SkyStream Two vs SkyStream One wasn’t just in my head. It really is that much faster. 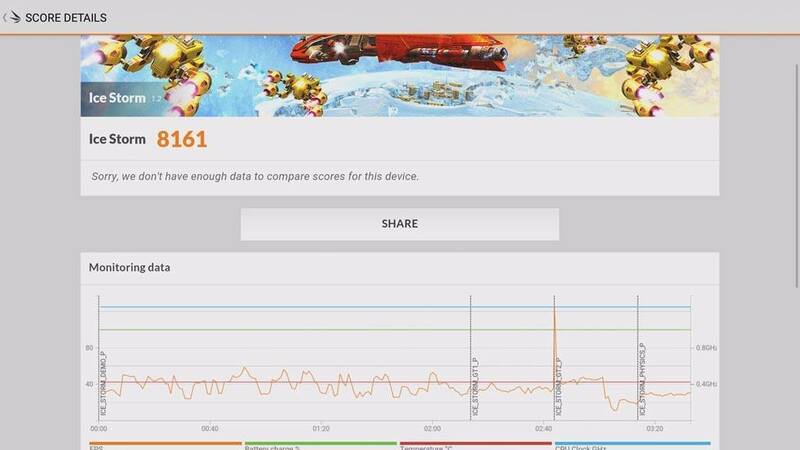 That score is also on par with the EZ-Stream Ti8, which uses the same chipset and graphics processor. Both boxes score right around the 43,000 and 44,000 marks, which makes sense. Next on the list is 3DMark’s Ice Storm. 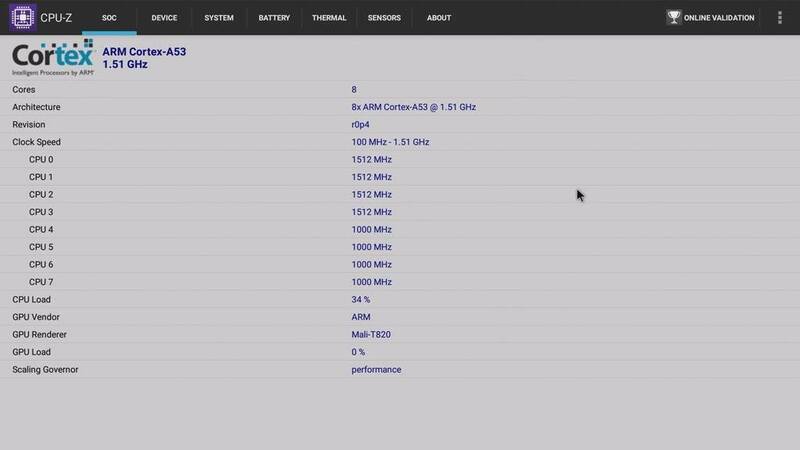 This is one of my favourite benchmarks because it’s geared towards graphics performance, rather than overall performance which is AnTuTu’s forte. Here, a device lives or dies based on the power of it’s GPU. A fast memory or CPU won’t be able to make up for lackluster graphics performance. The SkyStream Two really shines here. It scored an impressive 8,161 on Ice Storm and 5,205 on Ice Storm Extreme. While not as powerful as an NVIDIA Shield TV, it proved itself more than capable of handling game nights as well as movie nights. 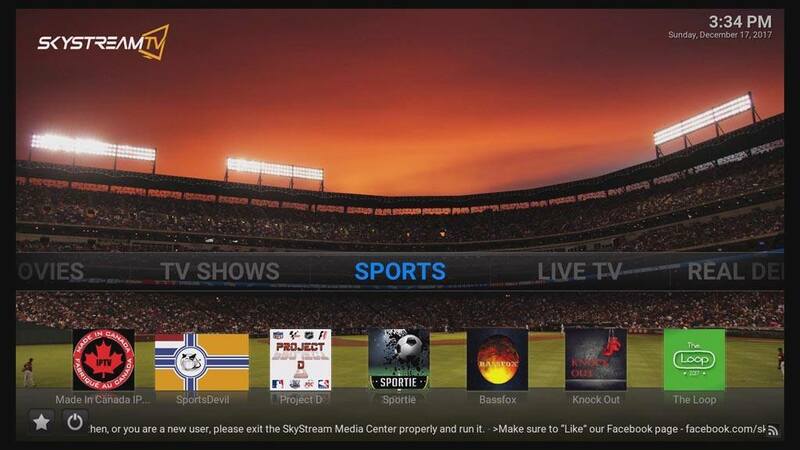 There’s no doubt that SkyStream put out an amazing Android TV box with the SkyStream Two. If I had one thing to fault them for it’s that it is a little pricey. I would have liked to see the box at closer to the $160-$170 price range rather than the $200 price range. That being said, you’re getting a lot of support and hand-holding for that price, so it’s not all bad. The performance of the box is excellent and I can’t overstate how easy it is to find and watch content using the SkyStream Media Center. If you’ve already got a SkyStream One, upgrading to the SkyStream Two isn’t going to give you that much better of an experience. That’s not a knock on the Two, but a testament to how good the SkyStream One was. But if you’re looking for an amazing new TV box, then this one should be on your short list. I configure my own builds and do not need support. How does the SkyStream Two at $200 stack up against the Vorke Z6 Plus which only costs $57. Hi Bobby. If you maintain your own build and don’t care about the support, then much of what makes SkyStream special isn’t going to be of use to you. As I’ve said consistently, SkyStream makes it easy to stream because they take care of everything for you. You’re likely going to be just as happy finding a generic box and tinkering with it yourself. I haven’t heard of Vorke before, but their specs look good. I’ll reach out to them and see if I can get a review sample to check out. Do u. Have modbro and show box ? Hi Alex. Thanks for the comments. It depends on what resolution you want to stream content. I recommend at least 10 Mbps if you want to stream in HD, or up to 20 Mbps is you’re looking for 4K streaming. My article Does Streaming Use Data has more information. HI Susan. Yes, Android boxes (no matter the manufacturer) will work anywhere you’ve got an Internet connection. Some of the apps may have different content available, depending on how the content providers handle geo-blocking. Hello Tim. Thanks for the time you put in to review these devices and inform your followers so they can make a sound decision on their investment. 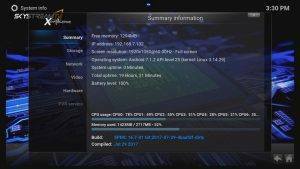 In a recent review you had mentioned both skystream and ez stream as an excellent choice for people who want a fully loaded box without the hassle of having to find and load their own apps. You also mentioned that they both use a similar updater app. Both of these devices seem to be very similar to one another. As you know EZ Stream is a little cheaper in price then Skystream 2. But I also don’t mind paying a little more for something if I can find the value in it to do so. This is where I need your input. Between the two, which device is the best choice in your opinion? What separates one from the other? Would I benefit from 1 over the other? I have a SkyStreamx 5 which I am happy with, although at first I was a lil worried that they stopped production on this unit so quick. Then came the SkyStream One which had the same fate that it didn’t last long, now we are at the SkyStream Two which I’m guessing will stay around awhile. 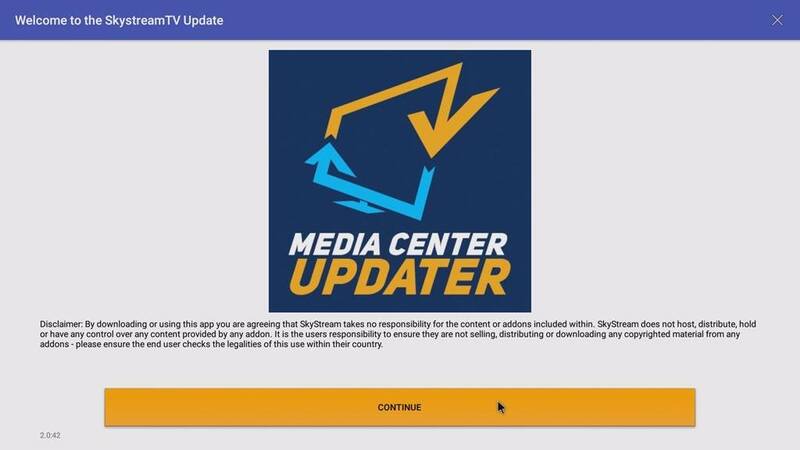 What is very cool about SkyStream is that recently they came out with a new update called Media Center which it looks like is also in the ONE & TWO. For them to upgrade this older box is very unusual but sure gave my X5 a boost big time, I suppose what I’m saying is SkyStream doesn’t forget about its customers running older boxes which really blew my mind, that they would take the time, money, and effort to upgrade older versions. SkyStream seems to value their customers which is a real plus with streaming boxes. Even though I have an old version with old ver of android it has the Media Center which makes it work much better& is more user friendly and was just way cool for them to do. So thanks SkyStream for not forgetting about us older customers it is greatly appreciated at least by me. Hi Michael. Thanks for the comment! The X5 did have a really quick life cycle, unfortunately. From what I remember, there were some manufacturing and supply issues that actually forced SkyStream to go a different route with their product development. It sucked for X5 owners to have the One come out so soon after the X5. But I firmly believe that if everything went smoothly with the X5, then we wouldn’t have the One or Two that we do today. Yes,from what I know the Skystream X5 had production issues keeping up with the demand. I believe there was also cost issue in that the X5 was going to be a lot more expensive to keep production ongoing. It was,and is a great device. The main thing that set it apart was the built in TV tuner and included DTV app that helped with the DVR functionality. I believe the app is no longer available also. 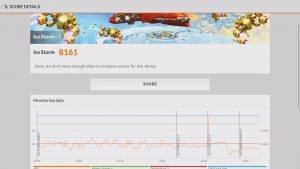 How does the SkyStream handle the iptv / m3u services for example – gears, unload, nitro ? HI, I am totally new to this, can I view the traditional US TV stations (without antenna) such as CBS, NBC but especially the stations showing old shows such as MeTV etc.? … and how about European TV stations? I am in Europe and the boxes they sell in Spain can receive most of all the EU stations and US as well. I have purchased five SkyStream boxes. Was very happy till the last purchase. There customer service is awful. I purchased a the Skystream Two in the middle of January. The remote does not work properly. I called Customer Service, emailed. The response received is rude, and not helpful. I am relatively new to streaming devices. I have an MXQ pro and it works relatively well . I have updated my router and internet connections so that I am getting over 50 mb/s download speeds most of the time. Sometimes nearing 100. However, I still have some issues with buffering . I am assuming this is because of the box. I want to upgrade so this is no longer an issue, but there is so much information out there as well as conflicting opinions . I wss looking at this box and seriously considering it . However, I have never needed support and have always done my own updating . I don’t use it for gaming or anything but streaming. Please help me choose. I want a box that doesnt buffer and is able to keep up with my router/internet speeds . Suggestions? Thanks in advance for your advice . There are a whole bunch of different factors why your streams are buffering, and most don’t have anything to do with the box itself. It could be a slow server that’s hosting the files, too much network traffic, slowdown at your router or too much traffic on your network. If you’re getting buffering in Kodi itself, then that’s probably the stream itself. If you’re getting buffering on everything, then it’s likely your internet speed or your router.